Hilton Garden Inn Dubai Al Mina is a contemporary hotel in Dubai featuring a lavish rooftop swimming pool with sun loungers and panoramic city views. Standing tall in the Jumeirah district, this hotel offers easy access to Dubai’s new beachfront district called La Mer. It is just a 10 minutes’ drive from the Dubai World Trade Centre. The hotel offers meeting spaces which can hold large or small private or social functions. Guests can reach the Hilton Garden Inn Dubai Al Mina from the Dubai International Airport which is just 15 minutes’ drive away. Guests can enjoy free Wi-Fi facilities here at Hilton Garden Inn Dubai Al Mina along with ample free parking space. The iconic Burj Khalifa is located just 8.9km from the hotel. The plush hotel enclosed in a glass façade is just 10km from the famous Jumeirah Beach, and just 4.4km from the Dubai Museum. The Dubai Mall is at a distance of 9km from here. The Dubai International Airport is about 11km from the property. 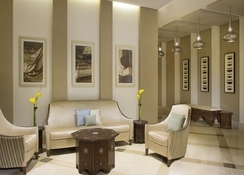 Each room at the Hilton Garden Inn Dubai Al Mina features a warm décor with modern furnishings. One can find flat-screen TVs, minibars and electric kettles here. The bathroom comes with complimentary toiletries and shower facilities. The suites add separate living rooms and sofa beds. 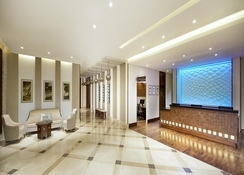 Guests can access free Wi-Fi facilities at the hotel. A delicious breakfast is served every day at Hilton Garden Inn Dubai Al Mina. The on-site Garden Grille restaurant and bar serve delectable local and international dishes with an exciting children’s menu. The bar serves some of the choicest spirits in town. Guests can also avail 24-hours room service if they wish to dine in the comfort of their rooms. The stunning outdoor rooftop pool is temperature controlled. The pool is surrounded by parasols and beach chairs giving it a laidback vibe. Guests wishing to stay active can work out in the fitness centre here. A free shuttle to the Dubai Mall, La Mer and a few other areas can be availed. The hotel has a little souvenir shop which is open 24 hours.